If you like to map with tilesets, this is a simple and easy option for getting the look of a hand drawn map into your game. 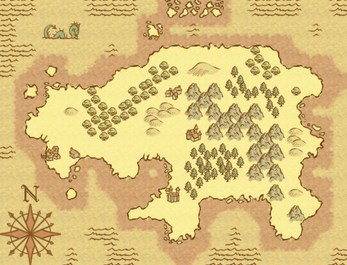 Because of the nature of maps, it can be place in games with a variety of art styles with no style clash. There are two versions of the files, with color wash and without. Tiles are formatted to work with RPG Maker VX Ace. It includes a full A2 sheet, a partial A5 sheet, a partial B sheet, a window skin and a character sheet of cursors. I purchased this set a couple weeks ago (from here on itch.io), just now getting it into Tiled to work with. It seems to be missing the two lighter background tile variants. There are two 6-section patches of the darkest of the backgrounds (the shade you use for shallows around your island in your sample pics here on this site), but none of the lighter two shades (the deep water, and land shades from your sample pics). 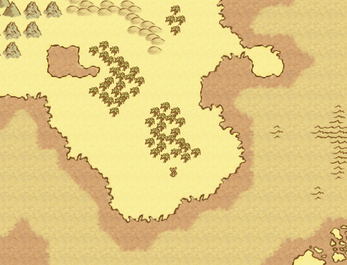 The two lighter shades are present in combining tiles, but not as background-fill tiles. Is there some trick to this that I'm missing? Ah, I think I understand what you mean. The plain repeating tiles without any transitions or edges, right? Well, since it's meant to be tiles for RPG Maker, there was no need to include those tiles by themselves, you can get them by using the autotile correctly. You have to do some copy and paste or use it as 16x16 tiles to get them working in non-RM use. 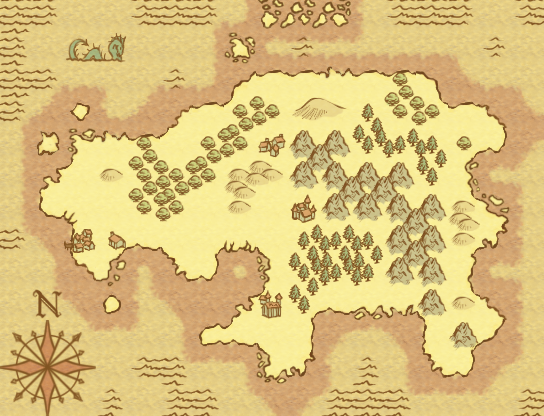 The sample maps were created using the artwork included with the pack, so if that's how you got them I don't mind at all. Thanks for the quick reply. It makes sense that you'd not worry about them if your tool takes care of it for you. 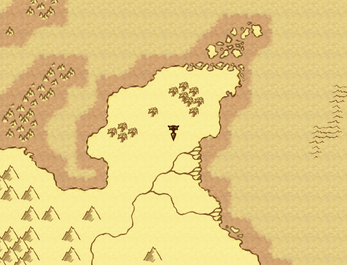 I am using TilEd maps loaded into Java/LibGDX, so needed the tiles in my map. The files I cut from your samples will work fine for my project. I love the look of these tiles! I had a question about the tree and mountain tiles in the right half of the A2 sheet. My understanding is that the four tiles in the upper-right of each set (next to the thumbnail) are supposed to be the inside corners of the transition edge, but it doesn't seem like any of the sets on the right half of the sheet work this way. How are inside corners constructed with those tiles? Glad you got it sorted out. If anything else is confusing, feel free to ask. This looks great! 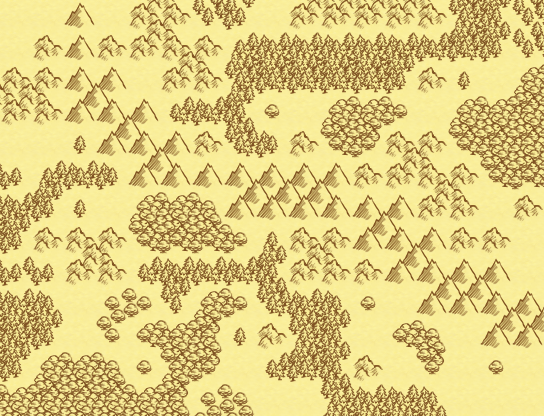 Question-- are the tiles set up in such a way that I could use this kit for procedural map generation, or was it made with a hand-placement in mind? It's made for hand placement, since all of the ground to water edge tiles are made to work with every single other ground to water edge tile, giving the map a lot of variation while still being tiles. 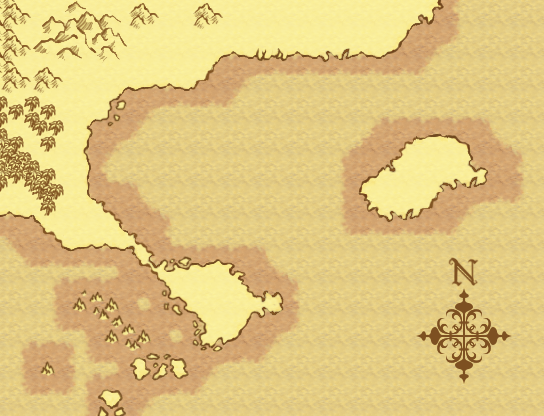 I suppose you could make them work in a procedural map, but I haven't done anything to make this work specifically for a generator. It's in RPG Maker VX Ace format if that makes any difference. Awesome! Bought and-- for the record-- I can totally do procedural generation with this. It'll work great with my basebuilder thing! That's fantastic! Glad to hear. Just curious, this for commercial use? Ooh, that sounds interesting. 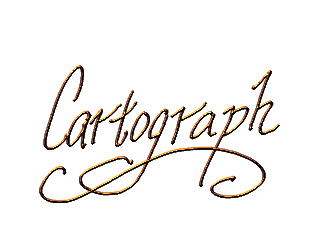 None of my GM's ever did actual maps it was always random small toys and dice and maybe a drawing on a whiteboard. I hope your players appreciate it.